National Instruments has extended its LabVIEW graphical system design platform with the release of LabVIEW SignalExpress, interactive measurement software which simplifies data logging, instrument control and academic instruction. Built on the basic measurement, analysis and reporting capabilities of NI LabVIEW graphical programming, LabVIEW SignalExpress delivers an easy-to-use, drag-and-drop experience for controlling hundreds of measurement devices. According to LabVIEW, National Instruments developed LabVIEW to give engineers and scientists a way to create user-defined applications for automating their measurements. Now, with the addition of LabVIEW SignalExpress to the LabVIEW family, LabVIEW is further simplifying common measurement tasks for its users while providing a simple path to the full power of the complete LabVIEW platform. Engineers and scientists frequently build data-logging systems to acquire and store measurement data to disk or a database. Using a few mouse clicks in LabVIEW SignalExpress, engineers and scientists quickly can acquire live measurements, log their data to a disk and export the data to a spreadsheet application, such as Microsoft Excel. LabVIEW SignalExpress also provides data-logging features such as alarm monitoring and condition logging. In addition, because the software is based on LabVIEW express technology, engineers can generate LabVIEW graphical programming code with a single mouse click to extend their applications with original user interfaces or add custom logic for more advanced data-logging applications. LabVIEW SignalExpress provides one-click, plug-and-play setup with the NI CompactDAQ USB-based modular data acquisition system and works with more than 270 data acquisition devices. 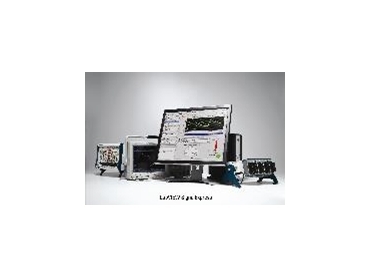 National Instruments simplifies measurements with LabVIEW SignalExpress data-logging solution that can dramatically reduce setup and measurement time. Using bench-top instruments for performing repetitive measurements or using multiple instruments for tests such as stimulus-response measurements often involves the manual and tedious task of adjusting knobs and buttons on an instrument. With LabVIEW SignalExpress, engineers easily can automate the acquisition, analysis and storage of data from more than 400 modular and stand-alone instruments. Engineers can save valuable hours of lab time by using LabVIEW SignalExpress to automate many common measurement tasks such as circuit characterisation, frequency sweeping and data logging. Engineers can further improve their measurement productivity by using more than 200 analysis and processing functions in LabVIEW SignalExpress including frequency, time and statistical analysis, to analyse their data as they acquire it. By analysing the data in real time during the acquisition process, engineers can identify measurement and design errors earlier and quickly make modifications, reducing the need to retake measurements. Engineers then can reuse their measurements on the production floor by automatically generating LabVIEW graphical code from LabVIEW SignalExpress. A significant challenge engineering professors face is how to help their students understand the real-world implications of theories learned in the classroom. The interactive LabVIEW SignalExpress environment helps students quickly visualise those theories and better understand their real-world applications. Using LabVIEW SignalExpress, engineering professors can give their students the hands-on practice of acquiring and analysng measurement data in the classroom or the lab without having to teach them programming concepts. Engineering students also can import simulation data from a wide variety of simulation packages such as National Instruments Multisim, the widely used interactive Spice simulation and circuit analysis software, into LabVIEW SignalExpress for comparison with real-world data. By combining the powerful circuit capture and simulation features in NI Multisim with the measurement capabilities of LabVIEW SignalExpress, engineering students can easily compare simulations and real-world data, resulting in fewer design iterations and higher-quality results.